Van Vliet's Frog is one of several names of this species (Smilisca baudinii) common to areas with permanent water in Laguna de Apoyo Nature Reserve, Nicaragua. 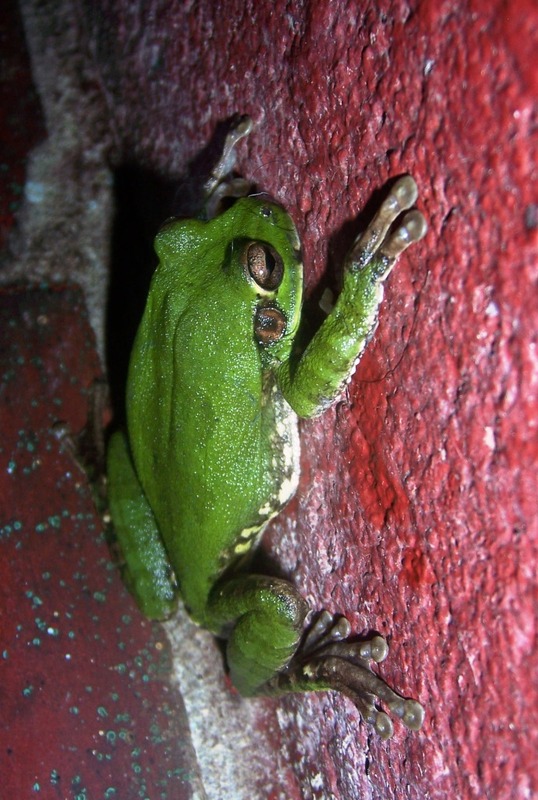 Also called the Mexican Tree Frog, it is truly arboreal, and uses "sticky" flat foot pads for adhesion rather than claws, which also make smooth house walls ideal microhabitat for this animal. Rain keeps things wet throughout the area six or seven months a year, but there are five months without surface water in many places in the reserve. Standing water is common, however, around houses and other structures, the lake itself, and a handful of creeks which flow into the lake. This species commonly enters Estacion Biologica, as did the one pictured below. 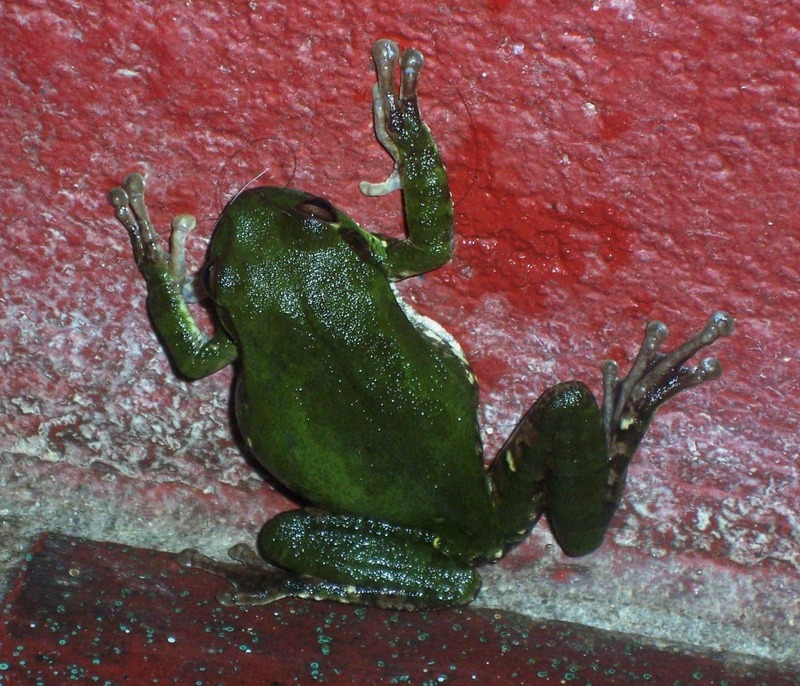 Van Vliet's Frog (Smilisca baudinii) on a wall at Estacion Biologica, Laguna de Apoyo Nature Reserve, Nicaragua. Photo by Jeffrey McCrary. Smilisca baudinii in Estacion Biologica, Laguna de Apoyo Nature Reserve, Nicaragua. Photo by Jeffrey McCrary. Smilisca baudinii is found in several disjunct populations from southern Texas to Costa Rica, placing our population near the southern edge of the overall species range. The species is generally common where found, but great regional variation has been noted, in fact this variation has led to some populations being described erroneously as unique species. In our area, we recently documented an interesting color variation, a so-called "light phase" (see below). Smilisca baudinii light (green) phase, Estacion Biologica, Laguna de Apoyo Nature Reserve, Nicaragua. This individual was sighted on a wall in Estacion Biologica and no one could identify it at first sighting. Some colors, particularly the markings on the inferior side of the animal, were more accentuated, whereas the back was completely covered in a vibrant green. In some populations, the so-called "light" phase is actually lighter than the more common mottled patterned individual, but ours is actually considerably darker and brighter. In the photo above, one can appreciate the camouflage pattern muted by the bright green coloration. The Van Vliet's Frog is a good jumper, and can be seen easily at night during hard rains, jumping on the ground, although it prefers vertical surfaces when dry. Van Vliet's Frog (Smilisca baudinii) in Estacion Biologica, Laguna de Apoyo Nature Reserve, Nicaragua. Smilisca baudinii escaping Jeffrey's grip. Laguna de Apoyo Nature Reserve can be a great place to observe wildlife. Ecotour companies regularly make excursions in our area. If you are interested in making a nature tour in the area, you are welcome to contact us. 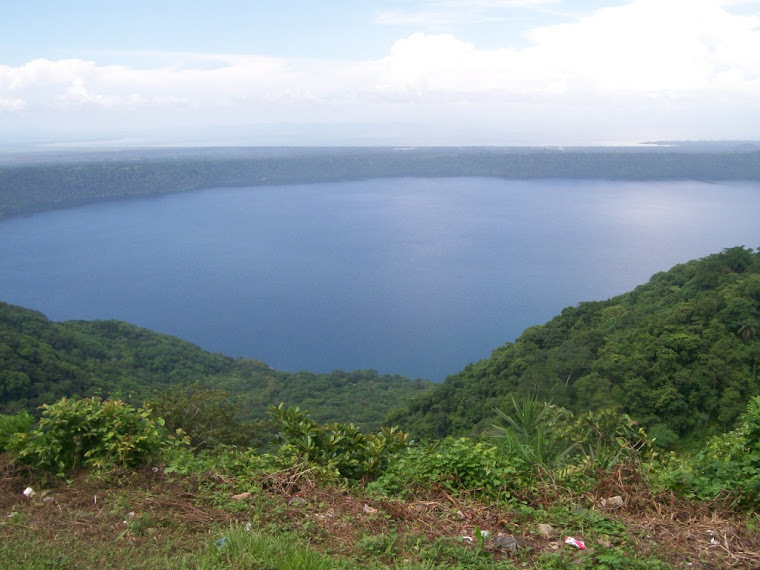 The volcanic crater lakes of Nicaragua attract lots of tourists, both Nicaraguans and foreigners. The water-filled craters are all beautiful, each with its own special features. Eight of these lakes, however, have endemic fish species, daughter species of the ancestral form of the Midas cichlid (Amphilophus citrinellus), living in them. The water of most of these lakes is transparent, perfect for observing these fish while SCUBA diving. During the nineteenth century, scientists and explorers admired the wide variations in color and shape among the Midas cichlid group, so much so that several species were described during the succeeding fifty years. Most of those species are today lumped back into A. citrinellus, given that this is the first described of the group from Lake Nicaragua. Its sister group, A. labiatus, has similar features but is generally longer and sleeker bodied with prominent lips and frenum. This fish became incorporated into the aquarium hobby trade in a brightly colored form, and is still known as the red-devil cichlid. Only these two species "survived" the scientific scrutiny of the first three-quarters of the twentieth century. Amphilophus labiatus showing its prominent lips in Laguna de Xiloa, Nicaragua. Photo by Ad Konings. A pair of Amphilophus zaliosus on nest, in breeding coloration. Photo by Ad Konings. ﻿﻿﻿The sacred trinity of A. citrinellus, A. labiatus, and A. zaliosus stood through the remainder of the twentieth century. During the current century, we incorporated the talents of Jay R. Stauffer, Jr. in the taxonomic descriptions of fishes in this group. 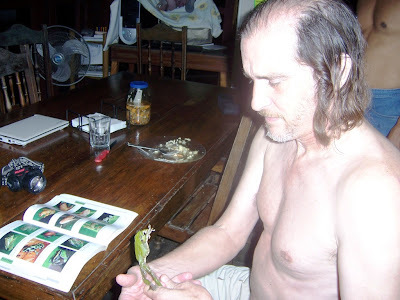 To date, he has led the descriptions of eight additional species-three from Lake Xiloa, and five from Lake Apoyo, Nicaragua. They will be discussed in a coming blog entry. Most of the species from Lake Apoyo can be appreciated in the video below. This second video, produced by Fabio Buitrago, shows underwater footage of endemic fish species in Lake Apoyo, facing a crisis of man-made dimensions-garbage. Everywhere. Why must we pollute their home? These fish-six species known and others not yet discovered-only live here in this lake. Amphilophus astorquii pair caring for fry, Laguna de Apoyo, Nicaragua. Photos taken during scuba diving by Adrianus Konings. 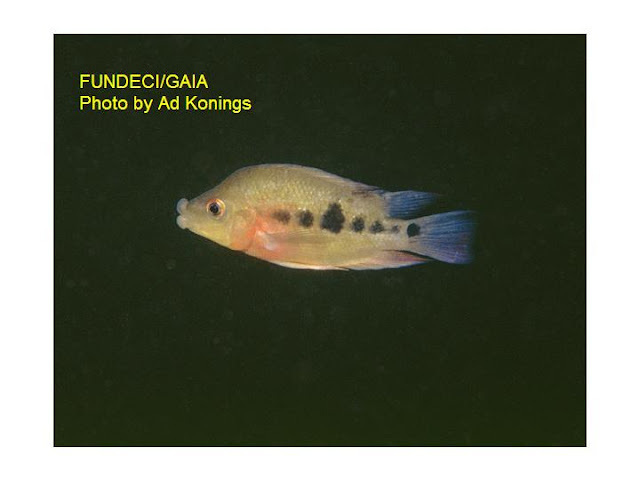 ﻿﻿﻿Would you like to help us protect and study the endemic cichlid species of Laguna de Apoyo? One of these species is already on the endangered list (Arrow cichlid, Amphilophus zaliosus, Critically Endangered-IUCN). Nicaragua needs your help, because the threats are many, and resources are few. We are seeking divers, biologists, people with experience in excel, and volunteers without any specialized skills to help us in this project. Please contact us if you would like to participate. The Laguna de Apoyo Spanish School also supports this project by providing a portion of its proceeds to fund our studies and conservation efforts. Would you like to learn Spanish? Think about attending our program, and go diving with us, too!